The aim of our experiments is to understand how the building blocks of nature - molecules - can be controlled, how they are set together, and how they change their structure during chemical reactions. The structure of a molecule defines its function, and time-resolved studies of structural changes are the key to decipher its dynamics, such as isomerization, protein folding, chemical binding, and breakup processes. Molecular dynamics is highly relevant in biological systems, as well as in planetary atmospheres and interstellar clouds. While x-ray and electron crystallography have been proven to be important methods in structure determination, diffraction imaging of non-crystalline samples is of growing interest, because a huge number of (bio)molecules, such as, e.g., the majority of membrane proteins, avoid growing crystals suited for crystallography experiments. The ultimate goal of our experiments is to image the structure of individual molecules at atomic resolution and tracing structural dynamics at ultrashort timescales. Recording such "molecular movies" is becoming promising by, e.g., ultrafast electron diffraction  and the recent invention of the new x-ray free-electron lasers (XFELs) . Using our experimental techniques to control the motion of large molecules, pure, oriented samples of large molecules can be created. These samples are ideal targets for coherent diffractive imaging experiments using upcoming XFEL sources. We have performed first benchmark measurements of such experiments at the Linac Coherent Light Source (LCLS) at the Stanford Linear Accelerator Center (SLAC) in collaboration with the Max-Planck Advanced Study Group, the CFEL Coherent Imaging Division, Henrik Stapelfeldt's group in Aarhus, Marc Vrakking’s group at the Max-Born-Institute in Berlin, and others. Controlling the molecules' state and spatial orientation increases the amount of information gained when investigating molecular dynamics by electron or x-ray diffraction imaging. Based on our previous work utilizing control of internal and external molecular degrees-of-freedom , we have performed coherent x-ray diffraction measurements of a quantum-state selected and strongly laser aligned sample of individual gas-phase molecules at the x-ray free-electron laser LCLS . This experiment provided a necessary step towards structure determination and study of ultrafast dynamical processes in single molecules at XFELs [Barty:ARPC2013]. Recent work also included experiments from multiply scattering low energy electrons in an "diffraction-from-within" approach on a ensemble of laser aligned gas phase molecules. In the future, we plan to extend the scope of FEL-experiments towards the study of ultrafast dynamical processes, the imaging of structural changes in single molecules in laser-pump, FEL-probe experiments. Moreover we will follow new holography-based approaches towards structural imaging at the atomic resolution level on isolated gas phase molecules. In addition, we designed and set up an experiment for electron diffraction. The electron-gun setup for a temporal resolution of tens of picoseconds and large electron pulse intensities is currently tested and will be combined with an existing molecular beam setup (controlled molecules). 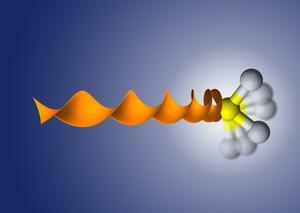 State-selection will provide a well-defined starting point for studying molecular dynamics. The spatial orientation will lead to better signal-to-noise and allow us to recover 3D information .